After becoming increasingly frustrated with both Netscape Communicator and Microsoft IE, I started to look around at alternate web browsers. For the past year I have been using Opera as my primary web browser. Based upon this experience, I highly recommend taking a look to see how well it meets your needs. Below are some of the features that I find particularly useful, this should help you determine if Opera is right for you. All software has tradeoffs, so you will have to judge for yourself what works best. Yes, I know that some of these features are buried in Netscape or IE. Yes, I know there are tricks and add on programs that add features to Netscape or IE. But is Opera is fast, easy to use, and under my control. It works great for me. So, here is what I like about Opera. Download. The most current version of Opera (7.20 on 11/23/2003) is a 3.2 MB download. If you have not previously installed JAVA, the download is 12.6 MB. Compare this with 29.3 MB for Netscape 7.1 and up to 75 MB for Internet Explorer 6. Good luck trying to install either Netscape or IE over a dial-up connection. Pop-ups. Opera lets you control pop-up windows. You can accept all, reject all, open them in the background, or only accept requested pop-up windows. This last option is useful because some web sites use pop-up windows to display links that you open. With this setting, you never see pop-up advertisements. Every time I use IE, I am amazed at how much junk shows up in the background when I close the web browser. Privacy. Opera only saves personal information that you specify. In the preferences you can enter your name, e-mail, address, and other information that is commonly entered into forms. When you start typing into a form this is the only information that it will use to automatically complete an entry. If you ever wonder what information is stored by a different browser, you will like this feature. I got really nervous the first time I wanted to enter my credit card number in a form, and IE knew the number. Cookies. Ever wonder just what is stored in your cookie file? Have you ever taken a look at it? Opera gives you lots of control here. I have Opera set to discard cookies when I close the program. This lets me browse sites like Amazon without any problems, but it prevents them from leaving a trail on my computer that anyone can view. You can also block third party cookies, frequently used to track use of banner ads. Security. You can tell Opera how to handle passwords. It can remember them or it can forget them as often as you like. You can set it as appropriate for your computing environment. Opera also handles all the standard encryption and certification protocols currently in use. The browser clearly displays the level of encryption and security used by different web pages. Speed. Because speed is a goal of Opera, users are provided lots of control. If you have a broadband connection you can increase the number of connections to simultaneously download multiple files. Opera also allows control over how the cache is used to store html documents, images, and other files. It will reload a document or image every time, use copies of files stored in the cache, or anything in between. This control is useful if you are developing web pages or trying to speed up your web browsing. Tabbed Browsing. My favorite part of Opera is the way it handles multiple web pages. The interface is similar to Excel with tabs to switch between worksheets. Just right click on a link and open it in the background. This lets you continue reading the current document, while the link downloads in the background under a separate tab. This is great for searches because you can open up all the promising links in the background. Then just click from tab to tab to go through the pages or back to the original search. This feature along with the built in search widows dramatically increases my search speed. This also makes it much easier to work in multiple browser windows. For example I can track Hurricane Isabel in the background while editing this paper. Customization. Most browsers let you customize the browser window. With Opera it is very easy. The program uses skins, which allows you to download different looks for the windows. All the customization is pretty obvious and designed to be easy to use. Opera makes extensive use of the right mouse button for context sensitive options, just right click on a tool bar bring up the customization menu. I like a minimalist screen that gives me the largest possible window. The figure below shows what I have on my toolbar. 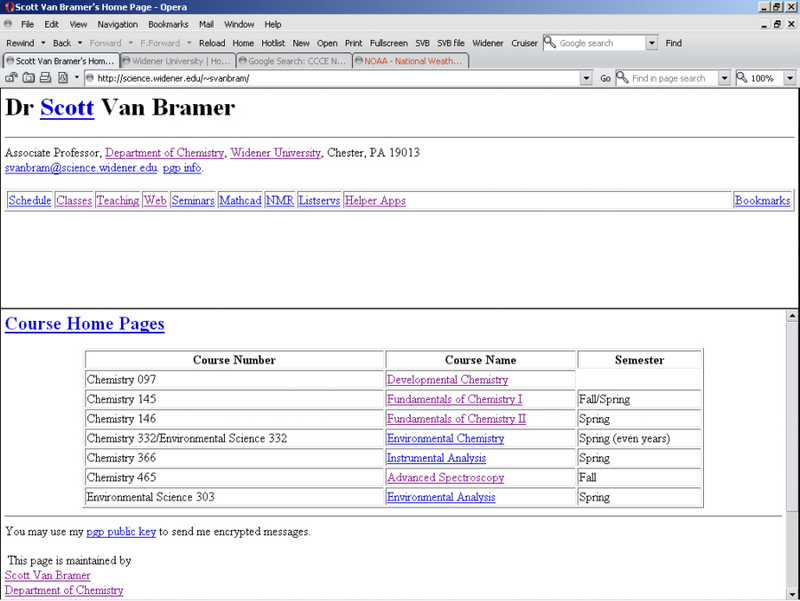 Notice the built in google search, zoom, and the tabs for different browser windows. Zoom. Opera will display and run in full screen mode. This is great for presentations. It also has a built in zoom that is easily and obviously accessible from the tool bar or using keyboard shortcuts. I use this in class to increase the text size so students can read from the back of the room. File Downloading. Opera gives excellent control over how files are handled. In the preferences you can define how different MIME types and file extensions are handled. This is similar to Netscape, but very different from IE which requires searching through all the file associations on the computer. No more scratching your head to decide why the link you are using opened the wrong plug-in. File downloads are all handled in the background with a single file transfer window that tracks files, their size, their download status, and where they were saved. Selecting a file will provide information about the source, where it was saved, the size of the file. A right click on the file name lets you stop the transfer, restart the transfer, or open the file. No more hunting to find where that file whent after you finished downloading. User Mode. If you have strong opinions about the use of color and layout in a web page, user mode is for you. This setting lets you specify many different preferences for how web pages are displayed (no more orange text on a black background...). A buttons on the toolbar switch between user mode, author mode. Accessibility. This is an important part of how Opera is designed. It is possible to use most web sites without needing a mouse, and there are many built in keyboard shortcuts to help assist with browsing. Although some of these features are built into other browsers, it is obvious that there is a strong commitment to this with Opera. The other weakness of Opera is printing. In general, I find that Netscape does a nicer job of page layout for printing. Opera sometimes has difficulty printing frame based web pages, outlines and tables. The print preview in Opera has a nice feature that lets you control which frames to print (all together, or individual frames), but opening the frame that I want as a full window seems to produce the most consistent results. If you are interested in Opera. Download a copy at www.opera.com and give it a try. The program is free if you don’t mind the banner adds in the top right corner. If you register your copy, currently $39 US ( $20 for students and free for K-12 schools), the banner advertisements are turned off.